Here’s what dog owners say about our trainers in Southern New Hampshire. “Backstory: I adopted my 3-year old lab/beagle mix a year ago, and quickly learned she has a serious case of fear aggression around large dogs and any strangers. She barks, growls, and is generally a frightened and aggressive mess around anyone and anything she doesn’t know – which is clearly a problem living in Boston. “First Choice Canine is an unbelievable asset to the northeast. I have two show/working Rottweilers. Before finding Khaled and his team I was shipping my dogs all over the country for training. 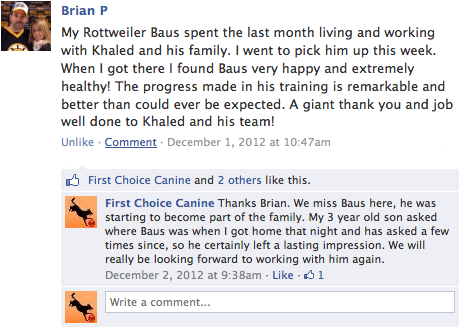 Khaled was referred to me by a close friend when I met his dogs and saw the caliber and reliability of their training. Since then I have worked with Khaled on a number of occasions and a number of subjects. We have worked on high level off leash obedience all the way to family protection work. I would not hesitate to recommend Khaled and his team to anyone. My dogs are family and I trust Khaled to handle my dogs without any reservations. “I have a 3 year old Beagle, Bradley, that I placed in a board and train program elsewhere when he was 5 months old and they abused and lost him. After thousands of dollars in medical bills and a lawsuit, I was left with a severely fear aggressive dog. I reached out to 5 different trainers who all failed and even put my dog on Prozac; First Choice Canine was my last effort. Lisa is a dog lover and rescue coordinator. She lives in Swampscott, MA and took her German Shepherds to First Choice Canine for off-leash dog training. Thank you for all the work you have put into Clara so far! She is like a different dog. She’s still her sweet and fun-loving self, but she’s listening to basic commands and she’s much calmer! Hooray! Thank you so much for all you’ve done for me and my ‘baby’ Sarge. I had given up taking Sarge for walks anywhere due to his aggression, and we have people who won’t come back to my house because he scared them. It’s awesome to take him for walks now, and have people stop to admire how beautiful he is and how well-behaved! I didn’t think it was possible! I also have to thank you for helping me with my ‘problem child’ Cooper. Good grief! We adopted him as a 3 year old from the MSPCA. You have saved Cooper’s life! He was about to be loaded into the car for a ride back to the MSPCA but you gave me hope that he could be a good dog. He had a good temperament but so many bad behaviors. Your training has helped him become a well-behaved, loving companion, which is what we had hoped for when adopting him. Thank you so much! The main reason for me to go for training was the dog aggression Kamden had with other dogs when I used to walk with them on leash. I couldn’t control them and they were running all over the place, and that’s the main reason I looked into dog training. I went to many dog training places, did puppy training with them, and even went into advanced training, and they were all based on pinch collars and using the pinch collar on a leash, and I still wasn’t able to control them, especially when Kamden was with other dogs. Once I worked with Khaled I was sure that they could go off leash. The main thing with training is that I also wanted to make sure they didn’t lose their personality. And it’s always good to have them under control at all times, but they are part of our family and my wife and I enjoy them at home and we want them to behave like dogs. Oscar’s aggression problem started off sort of minimal, and then it got to the point where we couldn’t take him for a walk or he’d try to lunge at other dogs, and attack the leash, and if I was in the way he’d bite me too. I’ve tried training Oscar at different places with different trainers, and I haven’t had any luck—I would only get so far and really we just never found anything that would get to the root of the problem. A friend of mine recommended First Choice Canine, and my first thought was, “Well, if nobody else can fix Oscar I don’t know how they’re going to be able to fix him, but we went away on vacation and (Khaled) took him for us and said I’d have a new dog, and sure enough, when we came back, he was a new dog! This whole process has made me become more aware of him and how he behaves, and being more confident as a handler. It’s a really cool process to see because I would never have believed it. We thought he was going to end up going to a new home. We decided to bring Brady to obedience training because we adopted him from the MSPCA. We felt like a lot of people kinda just gave up on him because it was really tough to train him—that’s why they put him up for adoption. Training was a huge part of my lifestyle with Brady. It was a lot easier ever since he did the obedience course. I’ve been able to take him to the park off-leash and not have to worry about him. He listens really well on command. It’s huge considering I’m a real outdoors person. I like to do a lot of trail walking, I hunt and fish, and it’s good because he’ll stay right with me, I don’t have to worry about him running off. I have two sons, a ten and a twelve year old, Connor and Aiden, and my two boys can walk Dundi throughout the city off-leash at any time. He follows them—he’ll move from my command to their command without a trouble whatsoever. I’ve had a lot of dogs in my life and by far Dundi, my Belgian Malinois, is the best trained dog I’ve ever had, and the training I received from Khaled is by far the best training I’ve ever seen in a dog in my life. Tanya brought her dogs Maia and Zeus to First Choice Canine to give them off-leash obedience and great social skills. Their days of doggy daycare delinquency are behind them, and now Tanya can take them anywhere! “Amazing!! I can’t say enough praises about Khaled and his team in every dimension of our training!!! CALM, CONFIDENT IN WHAT THEY DO, CARING, PUNCTUAL, and most importantly for me, PATIENT! I was a wreck and felt I was in over my head with a dog who outweighs me, and I was beginning to think was a dog I could not handle. With a bad rap sheet of play issues with other dogs, getting kicked out of doggy daycare my two giant sized dogs with two giant size issues, and a very distraught human mom, with a serious lack of confidence, called Khaled. At the beginning, I was in a panic. Zeus, (my Newfoundland/Neopolitan Mastiff mix) then 130 lbs at 16 months, who I know is not bad, needed manners in how to be around other dogs. Most importantly, his human mom, needed training on how to be confident with him. KHALED KEPT CALM AND HELPED ME GET PAST MY FEARS AND EXPLAINED EVERYTHING FROM DAY ONE! We opted for the 18 week on/off leash obedience. It was so worth the 1 hour trip each week for Khaled’s personal training. From a dog that played way too rough borderline aggressive, and another dog that was starting the aggression issue early, we now have two well mannered dogs that go with us on hikes in the woods, on trips to the park, outings to dog friendly stores, meeting new people, children and dogs along the way. Everyday I take them on their walks, with a new found confidence, and the two dogs are able to stay right next to me off leash as well as on leash. Of course leashes are brought, but just knowing they have the ability to be behaved either on OR off leash is an amazing feeling! I wouldn’t change a thing about our training! Khaled delivers the results you see on his website. You won’t be disappointed. THANKS SO MUCH KHALED FOR EVERYTHING! YOU AND YOUR TEAM ARE WONDERFUL!!! I can’t thank Khaled and his team at First Choice enough for working with us and our dog Rosie. We adopted Rosie through petfinder at 4 months and as she grew (and we grew), her behavior intensified over time: a new baby, a move to the suburbs, a change in dogwalker and less social interaction with other dogs. We met with a behaviorialist that diagnosed Rosie with Seperation Anxiety and Fear Aggression. We worked with other trainers throughout her life, some with the ecollar where she didn’t react well to pain where it was used inappropriately, some using only positive reinforcement (clicker) and were unsuccessful with her behavior modification. Medication was not an option we were willing to take, as the two disorders each require different medications that stimulate the other. We were scared that we couldn’t do what was best for Rosie and even considered a different home may be in her best interest. First Choice Canine knew the right balance of what Rosie needed – to help reduce the neurological issue of fear aggression and give her the confidence she was seeking. Now that we have Rosie back in our home, I am confident she is under my control and the fear aggression is no longer an issue. We have worked with her on our own for a couple of months and our job is to not ruin what Khaled and First Choice Canine have done 🙂 We are able to walk Rosie off-leash in situations that we have avoided in the past – near men (especially with baseball hats), around other dogs that she would normally lerched towards and even birds or squirrels. We are in control of her behavior. We have a loving part of our family back and are happy to report us as a success story. Thank you to Khaled and John. We are forever grateful for the relief and life you have given us. “At 1 year Darby started to show aggression towards people and other dogs, barking and growling. Vet gave me the name of a behaviorist in Nashua N.H. for problem dogs, we had to wait 6 mos to see her. Meanwhile he had bit 3 friends at my home no broken skin or injuries, but he had grown worst. At the appointment she told us to put him on the leash she had hooked on the wall, she sat on a chair within his reach, and Darby bit her on the knee. She became unprofessional, yelling that he needs to be put down immediately. After collected $150 for 5 min evaluation she sent us 3 page letter, her opinion Darby had to be euthanized. My daughter called First Choice Canine to make an appointment. Upon arrival we were asked to sit on the sofa in the lobby area. When Khaled sat down with us to discuss our problem Darby repeatedly started growling and lunging at him. Within ten minutes he told us Darby was not a bad dog, but a frightened dog, he was scared of people. KB told us Darby only acted out when their eyes met, and that he was not the type to bite and hang on, he did this to scare people and every-time it worked he grew more conﬁdent. KB was sure he could help stop this behavior and offered us two training choices: Board Darby with him for 5 weeks and he would train him for us or a 20 week program where we bring him weekly to be taught how to stop the behavior and regain control. When he talked of taking Darby in public off a leash as a well behaved dog, I thought it was a sales pitch, but was willing to try anything before putting Darby down. While I wanted option 1, KB thought option 2 was best. There wasn’t any pressure and he told me to think it over. We decided to go with his recommendation which was actually the least expensive option. Since we also had 1 year old female we signed both up for 20 week. “I’m on my 3rd dog, both were trained elsewhere. The others were good but not even close to the talent KB has. One of my dogs was chasing a frisbee that went into the street. He got hit by a truck and died in my arms. I swore that would never, ever happen again. KB taught me how to command my dog to drop to the ground, let the frisbee keep going and for the dog to turn around and come right back to me If you’re thinking of an electric fence, save the money and invest in your dog like I did. “Fantastic training! If you want your dog to listen to your every command while off leash, this is the training for you. After 14 weeks of training, I am conﬁdent that my dog is safe and responsive while off leash. We have been to busy parking lots, inside/outside stores, parks, and each time I am more & more excited with the results. I am looking forward to many years of enjoying the outdoors with my buddy off leash. I purchased a puppy from a breeder in France and after the first night when I gave her bath and attempted to blow-dry her, I knew she was going to be a challenge. This puppy had pretty severe aggression towards the blow-dryer at just 4 months old that I was concerned. Then I started working with her with very basic training and she was very aggressive toward the light corrections I was giving her when trying to teach her to walk with a leash. After she came at me and tried biting my leg at just 5 months I knew I was going to need some professional help. I knew of Khaled’s training company and his reputation so I have him a call and explained everything that was going on with my aggressive puppy. Within a day, he helped me to get her on a flight from Portland, Oregon and get her into his “Basic Puppy Training” package. Throughout her time there he would call me and send me pictures of her progress. By the time I was scheduled to pick her up, I was still hesitant and had already started looking for someone who would take on an aggressive dog. Upon arriving at the training facility, Khaled assured me that she was very good. I was still a little nervous to see her because I had been on the receiving end of her aggression and didn’t know how she would react when she saw me. When we got into the training room and he went and got her I was shocked. She was a completely different dog. She was happy and confident. She is completely off-leash trained and I can take her anywhere with me and know that she will listen when I give her commands. The real test came when I gave her a bath after I got her home. I could not believe that I could blow-dry her completely without ANY growling or biting or aggression of any kind. I truly went from wanting to find a new home for my aggressive puppy to a young dog that I can take anywhere and do anything with. She plays gently with kids, she is obedient in the house and I now cannot imagine a day without her. Years ago these two got their training at First Choice Canine. Because of that training Sabre and Kuma enjoy more freedom and stranger attention than any other dog I know. I can bring my dogs absolutely anywhere from deep woods tracking to crowded city sidewalks and know exactly how they will behave and act. up, so we checked them out. We liked that they had special classes in security as well as obedience. They showed us fully trained dogs, explaining in detail exactly how the training sessions would go. we call them about correcting certain things. It made raising our puppy and training him so much easier. approach for Lexi’s training because every dog was different and would respond to different motivation. they where working on, which included off leash training. OFF LEASH!! This was the most stunning part. “Khaled and Ashleigh are great. I brought my dog to his class because she had nipped a couple of people and had general walking issues – trying to lead etc. We started with me going to all the training classes for about 6 weeks and then due to my schedule switched to broad and train. My dog now walks beside me with no leash and stays beside me. She sit or lay down and stay there until I give the magic command at which point she runs right to my side. It was really a great transformation and I feel much more comfortable about taking my dog for nice long walks.